Posted April 8, 2016 by Tim Lepczyk & filed under Books. Little Red, by Bethan Woollvin, is a re-imagining of the classic story, Little Red Riding Hood, with one major exception. Instead of a hunter or woodcutter coming along to saveLittle Red, she saves herself and dispatches the wolf off the page. Posted April 5, 2016 by Tim Lepczyk & filed under Dad On His Feet. I started to correct her. I pointed and said, “Monster.” But, I mumbled the “ster.” What am I doing, I thought? “That’s right,” I said. I pointed to the figures in the picture. “Person. Person. Person.” There were no monsters for S—. She may not even have the word or the concept. The figures didn’t frighten her. She saw Max and the Wild Things and didn’t differentiate. Why should I teach her the word monster? Why would I teach her to fear that which is different? We finished the book. Max sailed home, in and out of a week, and back to a warm dinner waiting in his room. Soon, S— would fall asleep. I laid her down in her crib and slipped out the door. The whir of the sound machine, a soft susurrus in the background. Posted April 4, 2016 by Tim Lepczyk & filed under Books, Dad On His Feet. Reading: it builds empathy and increases language development. Beyond those two benefits, it’s also a wonderful form of entertainment. We value reading in our household and we read to our daughter on a daily basis. Though, I usually write about books that I’m reading; I thought I’d mention a few current favorites and get some recommendations in return. Premise: A tiger in a Victorian-era city is tired of the stuffy life he and his fellow animals lead.He wants to be himself. He wants to go wild. What happens when social conventions slip? Artwork: Simple and reminiscent to early video games. There’s an 8-bit quality that’s really wonderful. Reasons to love: Good message and kids like to roar along with Mr. Tiger. Premise: A little girl doesn’t want to go to bed. She and her parents talk about how different animals sleep. Artwork: Gorgeous. I’d love to frame a print and hang above S–’s bed. Reasons to love: Guides kids through the bedtime process. Teaches kids about animals. Doesn’t force the issue of sleep. Premise: Three little bunnies keep getting up in the night and interrupt Mom and Dad with their noise. Reasons to love: There’s an escalating pattern of bunnies not being asleep. Phrases like, “Looks like the bunnies are not in their beds” and “Goodnight, goodnight, sleep tight,” are popular hooks. Premise: Examples of how different animals move. Artwork: It’s Eric Carl, so if you like his artwork, it’s good. I’m sure I’m in the minority, but I don’t really like his art. Maybe, it’s slowly growing on me. Reasons to love: Gets your kids up and moving and learning about animals. Premise: A little beastie called a Snatchabook is stealing everyone’s books. Eliza Brown solves the mystery. Artwork: Warm, detailed, and gorgeous. Reasons to love: Teaches a love of reading and compassion to others. These are a few of our current favorites. What books should we check out from our library? Posted December 8, 2014 by Tim Lepczyk & filed under Dad On His Feet. 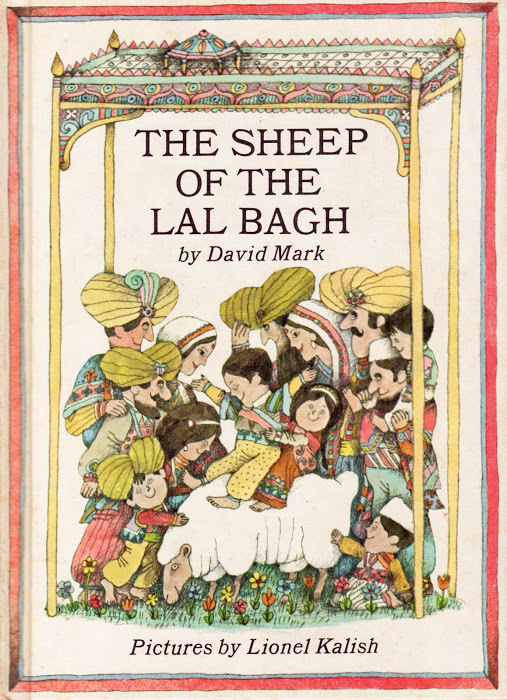 The Sheep of the Lal Bagh is one of those books my mom read to me as a child that I loved. There’s a sheep that eats the grass in a park in beautiful patterns. However, he’s slow at his job of trimming the grass. Eventually, the sheep’s replaced by a lawnmower and no one is very happy. Can you guess what happens next? Picked up a used copy from Abebooks for our daughter.